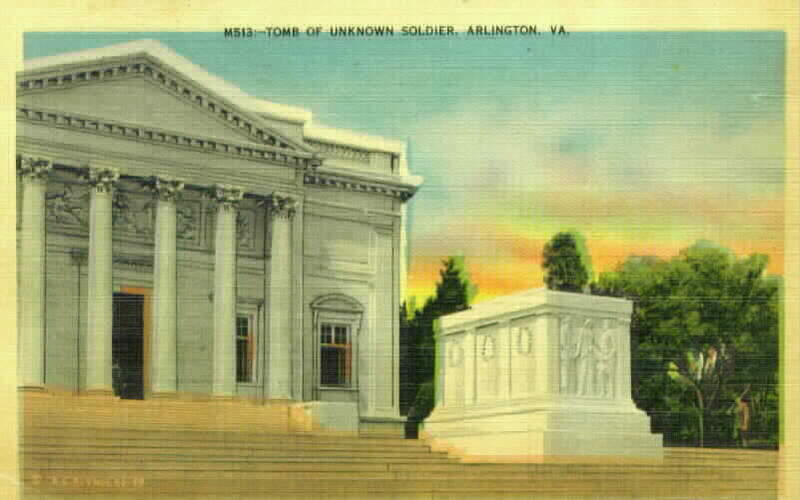 The Tomb of the Unknowns, near the center of the cemetery, is one of Arlington's most popular tourist sites. 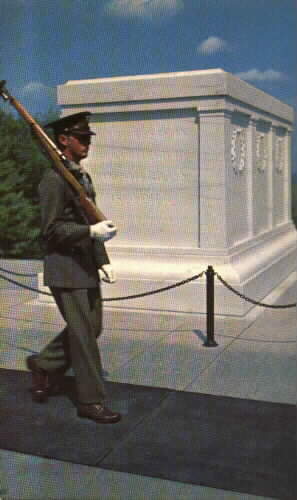 The Tomb contains the remains of unknown American soldiers from World Wars I and II, the Korean Conflict and (until 1998) the Vietnam War. 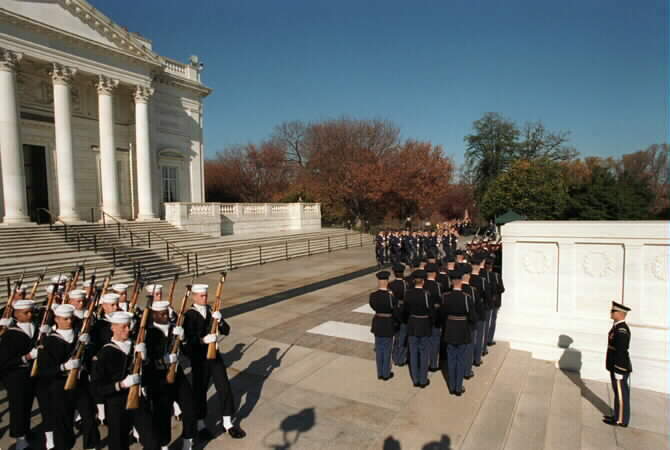 Each was presented with the Medal of Honor at the time of interment and the medals, as well as the flags which covered their caskets, are on display inside the Memorial Amphitheater, directly to the rear of the Tomb. 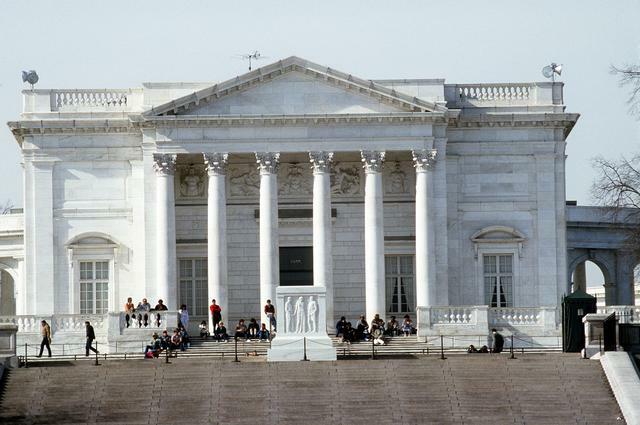 The Memorial Amphitheater has been the scene of the funerals of some prominent Americans (such as General John J. 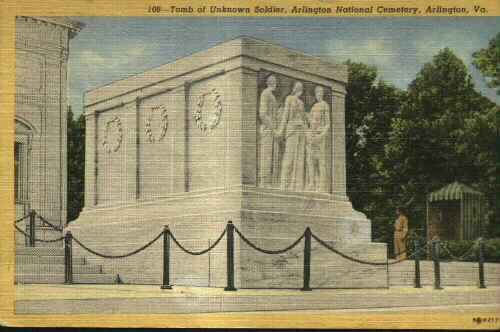 "Black Jack" Pershing) as well as the site of both Memorial Day and Veterans Days celebrations. 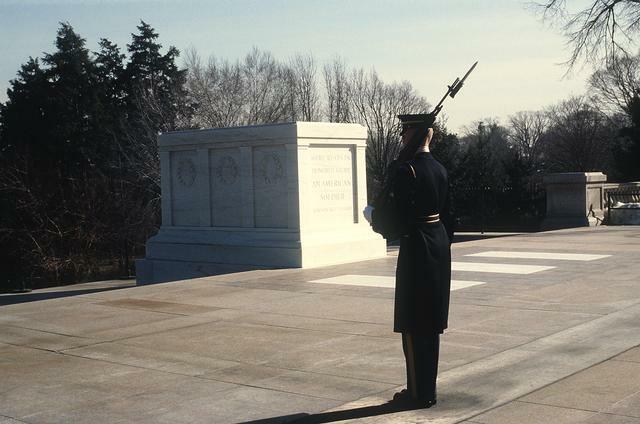 Dear webmaster, I am writing this E-Mail to give you a bit of history to the Stone that became the Tomb Of The Unknown Soldier and to state a minor discrepancy. The Stone was mined in a little town called Marble Colorado, located about 45 minutes away from Carbondale Colorado. 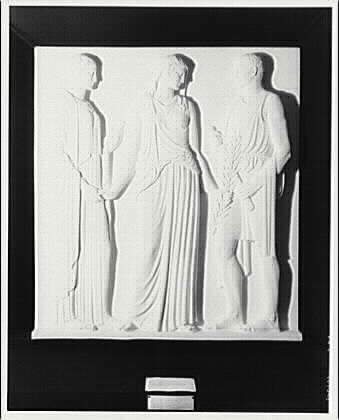 The caption underneath your picture states that the picture was taken in Vermont, when actually the picture was taken in marble at the finishing mill site before being sent to whom ever was contracted to carve the stone to what it is today. The mine from which it was mined was closed down in 1941, due to the fact that marble was declared a non essential resource to the war effort, and then re-opened in September 1991, My father was the re opening quarry master at the mine from which it came, Until he had an aneurysm. I hate to bring such a small thing to your attention, but I grew up in the town where the stone was mined and that picture was taken, and I have always been proud of the fact that I am from there. The company who owned the mine at the time that the stone was mined, was the Vermont Marble Company. 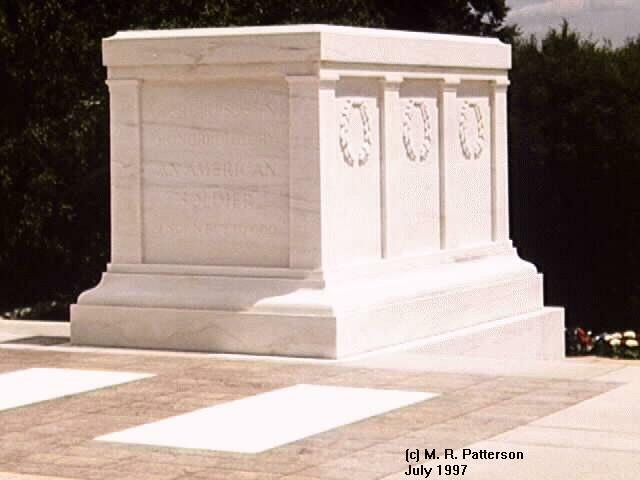 The marble came from the Yule Marble Quarry located near Marble, Colorado. 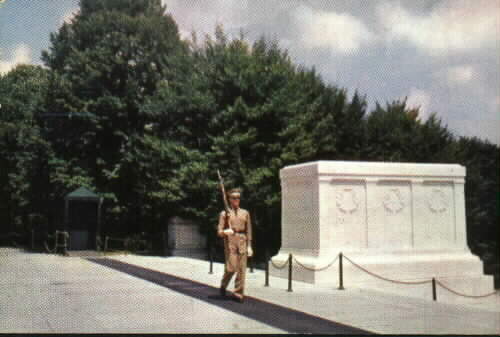 The Marble for the Lincoln memorial and other famous buildings was quarried there. The most fascinating part of the operation was the way the marble was brought out of the quarry and shipped from the area. An electric trolley arraignment drug the marble up on a steep piece of railroad track to the finishing building in the town of Marble. Some of the angles this operation worked on were very long & extreme (up to 30-40 degrees), and there are numerous stories about marble blocks falling off, or the tram cars breaking away and plummeting down the track. 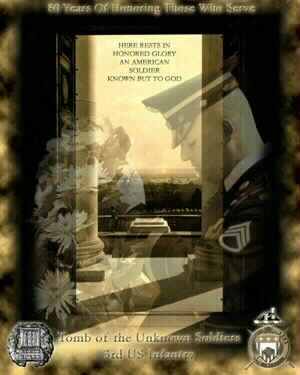 (This was all pre OSHA of course!) . The picture on your website shows another fascinating part of the operation. The Crystal River & San Juan Railroad operated from Carbondale to Marble from the late 1800's till about 1925. 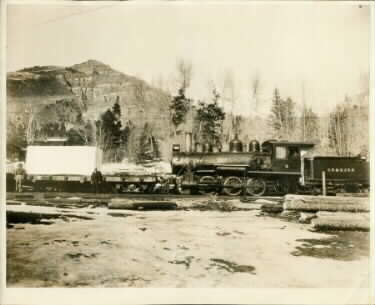 This was a narrow gauge railroad which outside of some passengers and some other freight, was built to haul the marble to the Denver & Rio Grande Western or Colorado Midland track at Carbondale. In the picture you can see the "CR&SJRR" on the tender of the small engine hauling the block of Marble. This operation was one of the most obscure in Colorado. There is a Marble website with some interesting history & information, http://marblecolorado.org/ take a look at the news section, a small town at it's best.